Black Necklace with Swarovski Pearls & Crystals by Farfallina. 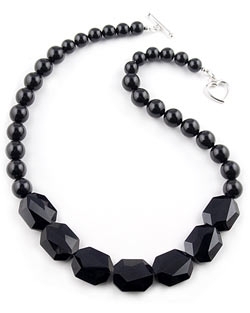 This striking necklace feature seven 18mm black Swarovski crystals in the front and 10mm & 8mm graduated black swarovski pearls on each side. Necklace measures 17.5" in length and has a 14mm Sterling silver heart toggle.